I think you already know that having forms with many input fields in your website makes it very boring for your users, often resulting in them leaving within a few seconds. Well, this problem can be fixed by using multi-step forms, also known as form “wizards”, improving the user experience when you need to collect a large number of data. 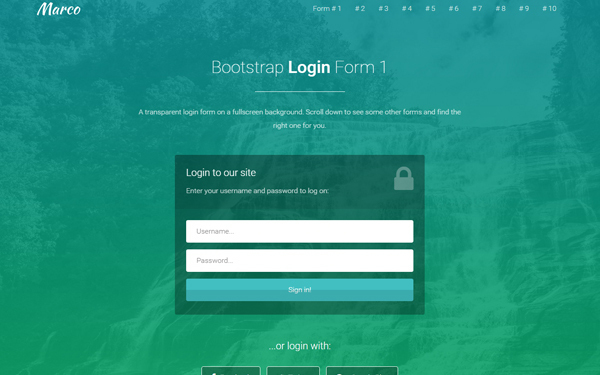 Another problem is that finding a free high-quality wizard form that can be used with Bootstrap can be a long task. 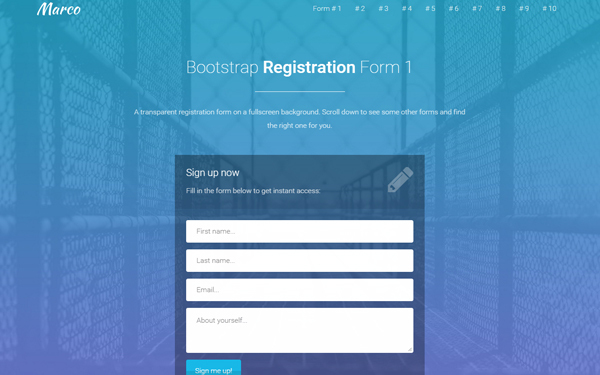 For these reasons, today’s web design resource is a Bootstrap form wizard template which is: free, beautiful (I hope you like it) and comes with fields validation. You can use this wizard template in personal and commercial projects, but you can’t sell or distribute it directly, “as is”. If you plan to use it, a link to this page or any form of spreading the word will be much appreciated. Is this correct? If so, for four (4) steps, do I need to increase both the steps value and the two percentage values (“16.66%”)? If the percentages do indeed need to be modified, what should they be for four (4) steps? What is the algorithm in play here? Thanks in advance for any-and-all assistance! Hello and thank you very much for this template. I’m using it for a basic job application form on my site. I’m using a few dropdown fields and I was wondering how to make those validate as well. Any help will be greatly appreciated. Thanks again. This is awesome! Thank you!! Quick question, I would like to make the step icons active links once they have been activated. How can I do this? So, if the step has not been activated yet, the link should not be working, but if the step has been completed, I want the icons to be active links so the user can navigate back to their previous steps using the icons. 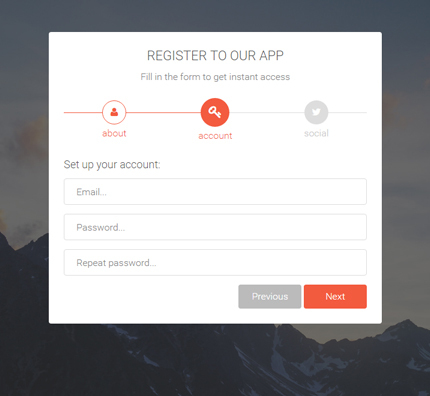 I would like to increase the width of the white background of the form, which css can I do this? Did you figure this out, I did it before Christmas, and now I want it smaller I’ve forgotten how I did it? For the “bar_progress” I hade a little problem, In the jquery part when you make the bar advance, instead of addition, it make a concatenation. If you have this problem just add parseFloat in front of NowValue and 100/number_of_step.